An Educational platform for Preparation and Practice Class 6. Kidsfront provide unique pattern of learning Maths with free online comprehensive study material in the form of QUESTION & ANSWER for each Chapter of Maths for Class 6. This study material help Class 6, Maths students in learning every aspect of Data Handling. Students can understand Data Handling concept easily and consolidate their learning by doing Online Practice Tests on Maths,Data Handling chapter repeatedly till they excel in Class 6, Data Handling. Free ONLINE PRACTICE TESTS on Class 6, Data Handling comprise of Hundreds of Questions on Data Handling, prepared by the highly professionals team. Every repeat test of Data Handling will have new set of questions and help students to prepare themselves for exams by doing unlimited Online Test exercise on Data Handling. Attempt ONLINE TEST on Class 6,Maths,Data Handling in Academics section after completing this Data Handling Question Answer Exercise. Evaluate preparation by doing ONLINE TEST of Class 6, Maths,Data Handling. The following pictograph shows the total number of absentees in a class of 30 students during the week. On which day the maximum number of students were absent? The following pictograph shows the total number of absentees in a class of 30 students during the week. Which day had full attendance? The following pictograph shows the total number of absentees in a class of 30 students during the week. Find the total number of absentees in that week? 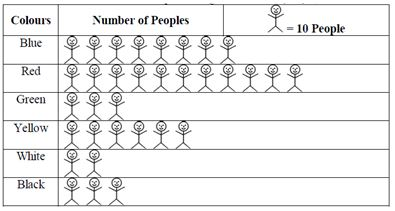 The following pictograph shows the total number of absentees in a class of 30 students during the week. find the total number of absentees on Tuesday? The following pictograph shows the total number of absentees in a class of 30 students during the week. On which day 5 students were absent? The following pictograph shows the total number of absentees in a class of 30 students during the week. On which day 30 students were absent? The following pictograph shows the colours of fridge preferred by customers in a locality. Find the number of people preferring blue colour. The following pictograph shows the the colours of fridge preferred by customer living in a locality. How many people liked red colour? The following pictograph shows the colours of fridge preferred by the customer living in a locality. Which colour preferred most?